Jimm Juree was well on her way to becoming the primary crime reporter for a major Thai newspaper, but when her mother sold the family home and bought a dilapidated beach "resort" in southern Thailand, Jimm, her brother, and her grandfather had little choice but to follow. Jimm's brother is busy with his bodybuilding career and his much older girlfriend, Jimm's ex-traffic cop grandfather seldom speaks, and her mother spends most of her time off in her own little world. It's up to Jimm to do most of the maintenance work pertaining to the business. When a mother and daughter rent one of the cabins for an extended period, Jimm is thrilled at the chance to earn some real money, but she knows immediately that these two women are hiding something. And what about the head she finds washed up on the beach? There's a story there, too, but the police don't seem to care. Well, if they won't find justice for that head, it's up to Jimm Juree to do what's right. If all works out well, she'll have a story that will have everyone at her old newspaper rueing the day she left. It should be no surprise to anyone that Colin Cotterill's way with words has translated easily from the Laos of the 1970s in his Dr. Siri Paiboun mysteries to modern-day Thailand. From the mind of a wily and rebellious old Communist, we now get to enjoy following Jimm Juree, a Westernized Thai woman who has a talent for rooting out stories and surviving one family calamity after another. Although I love Cotterill's humor-- and there is plenty to be found here-- he also deals with serious topics such as corrupt policemen and the plight of poor Burmese citizens coming to Thailand in hopes of work. Even that mysterious mother and daughter staying at the Gulf Bay Lovely Resort and Restaurant have important things to teach us. Each of these topics blend into the story seamlessly and add their own elements of suspense and danger. The first book in the series, Killed at the Whim of a Hat, angered some American readers by using flubbed lines from speeches made by former President George Bush as chapter headings. Even though those quotes tied into the story, the perceived insult to a president was not appreciated. This time, Cotterill heads each chapter with a line from a song that has been phonetically translated by Thai karaoke and lounge singers. Several are absolutely hilarious, and the author does provide the correct lyrics at the back of the book. Once again, these lyrics do tie into the story, and this time in a very exciting way. 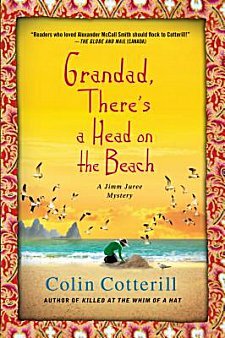 Clint Eastwood also plays a part, but you'll have to read Grandad, There's a Head on the Beach to find out what it is. Colin Cotterill has long been a favorite of mine for teaching me how other cultures perceive the world, for his sense of humor, and for his storytelling ability. It's my hope that you'll read his books and come to a similar appreciation. Cathy - I'm a Cotterill fan too. I just love his wit and yes, his way with words is terrific. You're right too that he is able to show other cultures in a very effective way. And I do like the way he draws his characters. I should check, but I would imagine that he's an author who's much more popular in other parts of the world. He should be popular here as well! I have a feeling I'm going to love this author. I think he's right up your alley, Barbara! I have not read any of Cotterill's work but it sounds like I should - great review Cathy. Thanks, Joanne. I hope you get the chance to read at least one of his books. I think you'll enjoy it.